A service call may be as simple as sending a service person out to replace a faucet in a house. Or it may involve a number of personnel with different certifications, supervisors, an extensive material list, detailed step-by-step instructions, and testing and collecting results. These two types of service jobs, and everything in between are handled by the Service module. Send your service people where they are needed, when they are needed! Easily find and assign the earliest available appointment times and dates for customers! Coordinate multi-discipline support for complex jobs! Run a large event from setup to teardown, and everything in between, flawlessly! Review and manage service projects on a two week schedule board! ALERE provides real-time support for those doing the work. Build an overview of each customer site detailing the items to be serviced including images or photographs of the units. Keep accurate records of warranty and serial number information. Identify service jobs or inspections that are to be carried out and the frequency with which the work is to be performed. Track the date of the last service, the next scheduled service, and the type of work to be done. Review past activities and drill down to the actual service tickets used to do the work. ALERE is business software that includes powerful inventory control with perhaps the best serial/lot traceability in the industry. Intregrated CRM offers many advantages over stand-alone packages such as creating quotes for prospects that can be released as orders when the prospect becomes a customer. Excel compatibility, including 64-bit, is embedded throughout the ALERE report structure and provides an easy way to export information for custom analysis. Truly integrated financial software will always produce better results, for less cost, than tying together unrelated applications. A service call may be as simple as sending a service person out to replace a faucet in a house. Or it may involve a number of personnel with different certifications, supervisors, an extensive material list, detailed step-by-step instructions, and testing and collecting results. These two types of service jobs, and everything in between are handled by the Service module. Use a Service Catalog to define the service work elements including the type of service, a list of activities or tests to be performed, the class of personnel and equipment that will be utilized, and a list of the material that will be required. It graphically constructs service steps which are appended to service tickets. Material required for service work is allocated in inventory and included in MRP planning. Build a custom overview of each customer location using Site Information. Define each serviceable unit, when it is to be serviced, and warranty information. Develop Resource Classifications which identify the personnel or equipment that comprises each labor competency or class of equipment. The Service Ticket contains the initial job requirements and billing information. It also records the resources expended and the results of tests that were completed. Data is collected through transactions that may be posted manually or by utilizing bar code devices. Each Service Ticket has a complete audit trail, consisting of activity history and related general ledger postings. 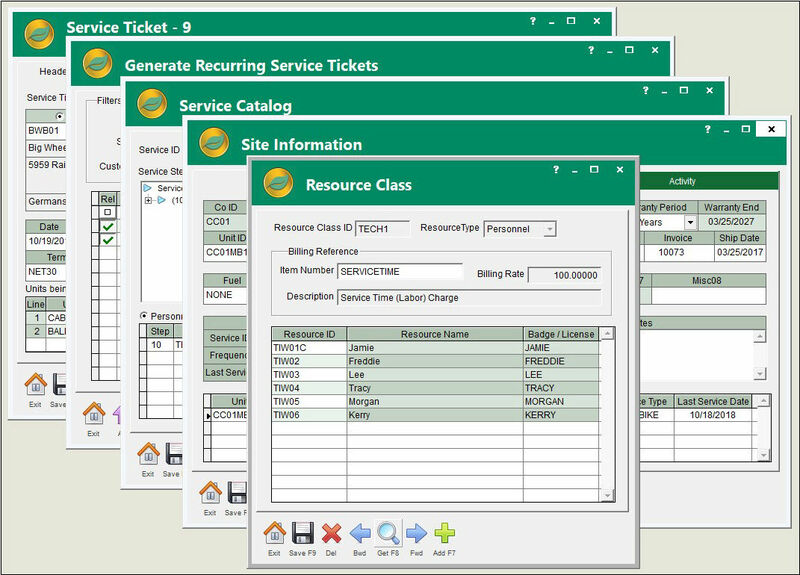 Use the Recurring Service function to allow the generation of service tickets for clients with units enrolled on scheduled service plans. Instantly schedule a service job for a customer when they request a date and time or easily find the earliest available appointment. 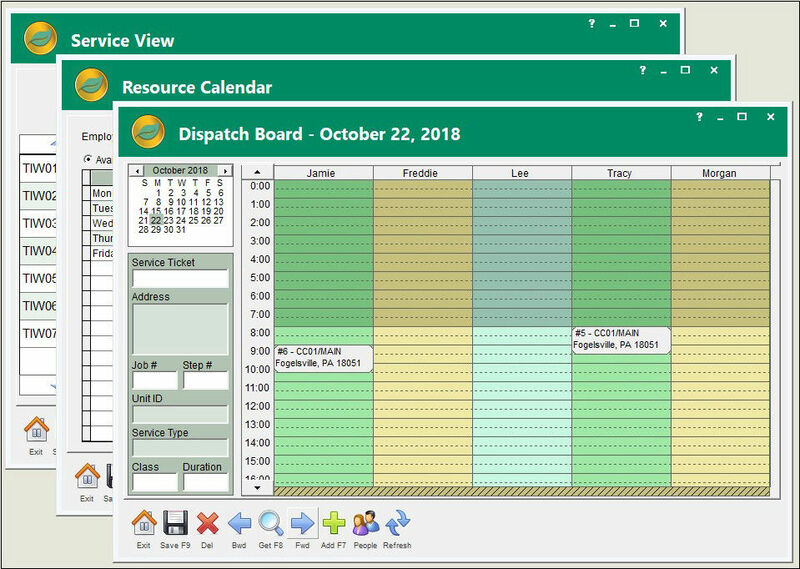 Service jobs can be assigned and managed, all in real time, for service technicians and their available time slots using drag and drop on the Dispatch Board. Review an interactive graphical fourteen day overview of the service schedule using Service View. The schedule is scrollable and you can zoom down to a one hour resolution or zoom out to see all fourteen days at one time. Simply click on a job to display service ticket information on the schedule, then drill down to the actual ticket. The schedule can be edited in real time using drag and drop. Employee work hours, holidays, vacations, and personal time off are created and monitored on a Resource Calendar. Daily dispatch schedules and material pick tickets can be published for service personnel. You can explore the details of ALERE Service by reading the details or, better yet, contact us for more information or to arrange for a personalized webinar.